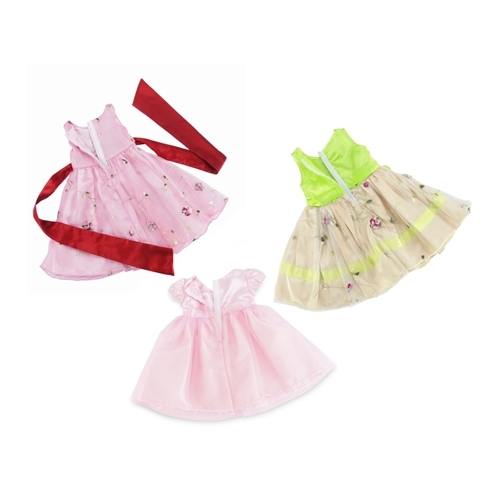 Your special 18" doll will look so pretty in each of these 3 beautiful party dresses! What a VALUE! The first dress Included in this amazing set is lovely pink, ankle length dress sure to make your doll feel special! The sheer pink overlay with delicately embroidered flowers and large satiny red bow adds "wow" factor to this gorgeous springtime dress. The second dress outfit included is a pretty calf length lime green party dress with a beautiful embroidered sheer overlay, and a perfectly sized matching purse. The final ensemble is a stunning doll dress for any party, or a perfect flower girl dress for that special wedding. The full skirt includes multiple layers of soft pink tulle, and the darker pink satiny waistband has pretty rosette details. Included with this stunning party dress is a matching satiny headband that stretches to fit nicely. These amazing dresses all feature our special "no grab" Velcro closure, making getting dressed a snap! Perfect for your 18 inch doll's next special event or holiday party. The hard part will be how to decide which one to wear! 3 gorgeous doll party dresses, each a different style, adding fashion and versatility to your 18 inch doll wardrobe. Perfect for a party, holiday or any special occasion, for a price you can't beat! Awesome 18" doll dress value set, includes an adorable ankle length pink dress with embroidered flowers and white satiny red sash, a super pretty sleeveless lime green dress with embroidered flowers and matching purse, and a gorgeous soft pink flower girl dress, with matching satiny headband. 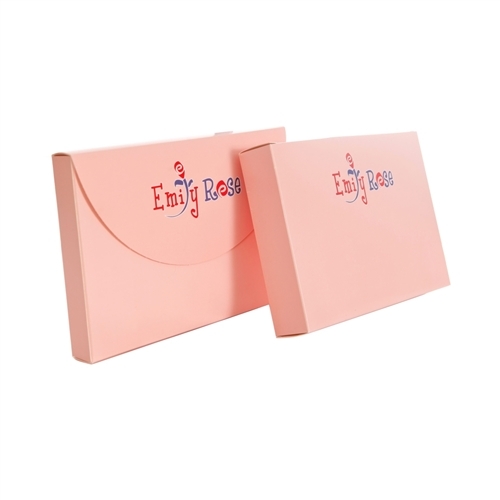 Outfits are lovingly packed in a classy, pink gift box with Emily Rose logo.